To complete this step, please make sure that your node is configured successfully and appears in your Rudder web interface. You have to tell the Rudder root server that a node will be a relay. To do so, launch the rudder-node-to-relay script on the root server, supplying the UUID of the host to be considered as a relay. You can find the UUID of your node with the rudder agent info command. 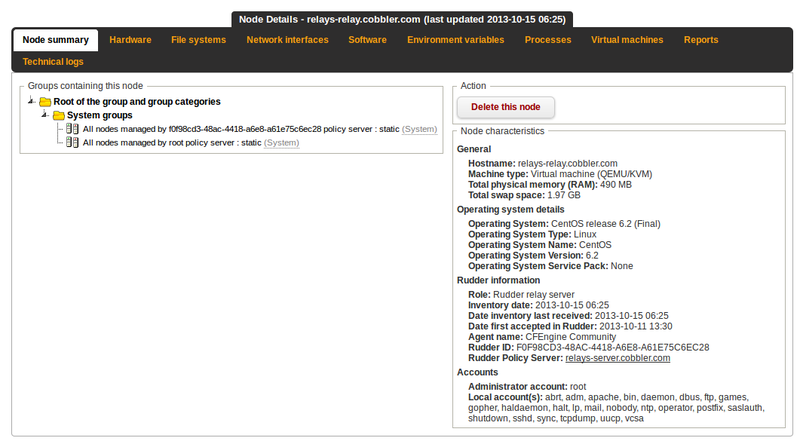 This is an example of node details pane showing a relay server. Note the "Role: Rudder relay server" part that shows that the machine has successfully changed from a node to a relay. When you have at least one relay, you will likely want to add nodes on it. After those steps, the node should be registered correctly on your Rudder infrastructure.